These days, I sleep the sleep of the dead. Okay, not quite, maybe that was bad taste. But I sleep heavily, deeply and dreamlessly, and it takes a lot to wake me up. I can't move or turn over in bed due to my bad shoulders and general mid-section discomfort, so I sleep all night on my right side, in the same position, my cat a few inches away. I am not an early-to-bed girl - I stay up until about midnight watching what my husband calls my "freak shows." (Hoarders, Honey Boo Boo, Intervention, etc.). After whatever show I watch, I go to bed and fall asleep instantly. I sleep late, until about noon, which gives me a good 12 hours, and when awakening comes, as it still does, it creeps upon me slowly. My eyes open, I take a few deep breaths, I take stock of where I am, my pain level. I gentle my body like a horse, soothing it, making slow motions, until I can grab my phone on the nightstand. Still resting, I check the time, check for emails from my husband, check the status of Tapped Out (yes, I'm addicted). I look at the weather out my window. Is it sunny and cold? Raining? I take a moment to appreciate the beauty, and the simple fabric hung by my friend, and the shining crystals above. The cat gets up and stretches, she knows the bed is only hers for as long as I'm in it. If I get up, a dog may jump in any time. She hops out, tail up, running to the bathroom. Finally, I am able to sit up, get out of bed, let these weird bubbles near my liver rise, and then walk stiffed-kneed to my coffee pot. I still drink coffee before I hit up the bottle of pain meds. Coffee was my first addiction, and it will be my last. The lateness of the start of my day may surprise those of you who follow me on facebook, because posts appear from me beginning early in the morning. They are ghost posts - facebook allows you to schedule them in advance. I like to have something cheerful in the morning for my friends who do get up - even if I am still asleep. I don't do it too far in advance, for obvious reasons. Would it be good to have a funny cartoon appearing from me with some sarcastic saying after I'm gone? I am not so sure it would: the dead should stay dead. At least online. Wednesday morning I was not treated to my gentle routine. About 10:30, I was awakened by the sounds of my dogs barking. I ignored them thinking it was the mailman or a salesman. But, they got louder, more insistent. Trista started howling, Cherry was barking and hiccuping in fear and I heard scrabbling and jumping at the door. The whining and barking and howling went on forever and began to make me nervous. Was somebody getting in? I had to get up and go see. I hauled my not-ready body out of bed and stumbled to the door, breathing heavy all the way. If it had been a bad guy inside to rob my house, I was ready to be knocked to the floor. Instead, it was my Cleaning for a Reason Housekeepers, on the porch with a vacuum, which the dogs, of course, felt was the enemy. They were going to chase that vacuum away and use every vocal power they had to do so. I let the housecleaners in, holding my jumping bean dog down, a miracle with my bad shoulder. I explained that I had scheduled them for the 22nd. They normally give a warning call when they are on the way over, but my phone has been broken for over a week and isn't scheduled to be repaired until the 21st. During this conversation, I got dizzy and had to sit down - suddenly. I had not gathered enough air to walk to the door, hold the dog and have a conversation at the same time. I can still do it, but it takes coffee and a period of wakefulness to achieve. I told them they could stay or go, but normally I liked to pick up the bigger chunks before they got here so if they wanted to stay it would be messier than normal (which is saying a lot). They spoke to each other in Spanish than told me they would come back, that I didn't look well. At least one appearance surprised them - me or my house. I was dizzy and in my PJ but didn't think I looked that bad. I didn't feel that bad, just morning cancer-ish. So, it was probably the house. Truthfully, as much as I enjoy the results when they are done, I was glad for them to go; I was not prepared for all the dog-controlling I was going to need to do with them in the house with that armed and dangerous vacuum cleaner. I went back to bed, and the cat appeared from the bathroom and hopped back up with me. But, the dogs were still excitable, and I'd forgotten to close the door. Trista jumped up on my bed and lay over one leg, quite nonchalantly like she didn't know she wasn't supposed to be there. She would not, however, look at me. That left me with a dangerously hissing cat, and not being able to sit up because of my shoulder, I was left trying to push/kick the dog off the bed. My kicks are about as strong as a kitten's these days and she didn't even notice, so I had to wiggle my way out from under her, turn over, get up, grab her collar and make her get down. She is not allowed on the bed, and I never allow her to stay on the bed. Why she continues to test me is a puzzle. I need you, Dog Whisperer. I got back to bed, still hoping for more sleep. But then my cell phone rang. It was AT&T, who offered to come and fix my land-line early. I would be at doctor's appointments all day, so I had to say no. Few people use my land-line phone and if it was up to me we'd get rid of it, but my husband's cell is paid for by the state so he won't use it for anything but business. He's such an honorable man. The State of CA wastes a lot of your money but not because of my husband. Wednesday, I had another cortisone shot in my left shoulder. I am really hoping that this one does the trick and at least allows me to turn over in bed or reach for something with my left arm. It's now Friday and seems a bit better but it's early yet. It has been years since this frozen shoulder nonsense started, and I no longer think I am capable of healing from it. I just want minor improvement: a lessening of the pain and the ability to sleep on my left side is all I ask. I also started a new chemo protocol. The chemo is Gemzar, which has been used in many woman. I also am going to be allowed to try a new anti-HER2 agent, Perjeta. Perjeta has had great success in women with HER2 disease; but that has only been shown in women who have not been treated with other chemos - chemo newbies, like I once was. (Um, Gemzar is my 7th). It has also only been tested in conjunction with docetaxol (taxotere) and herceptin. I am using it off-label so there is no information as to whether it will work with me, in combination with gemzar, or anything. Still, it is worth a chance. And, I have to thank my fantastic insurance company, who has yet to deny anything. Perjeta, being brand new off the R&D line, is $10,000 an infusion. Just sayin'. I got Perjeta and Gemzar on Wednesday and Herceptin on Thursday. So far, I am not feeling any unusual effects. It's the same old, same old. Chemo is chemo. A friend brought by some delicious food the day of my first gemzar/perjeta cocktail Truthfully, I have no appetite and have no interest in eating, unless somebody brings me something. Then I will eat it. I don't have the feeling of hunger anymore and nothing sounds good enough for me to bother to spend time preparing it - but if it is in front of me, I will eat it and even enjoy it. And, have I enjoyed this food, oh my. One of the items was a mandarin orange caramel cake. Fabulous. So, we shall see. Maybe my shoulder will get better. Maybe my cancer will go into remission, or at least stay stable. Maybe my dog will stop jumping on people. 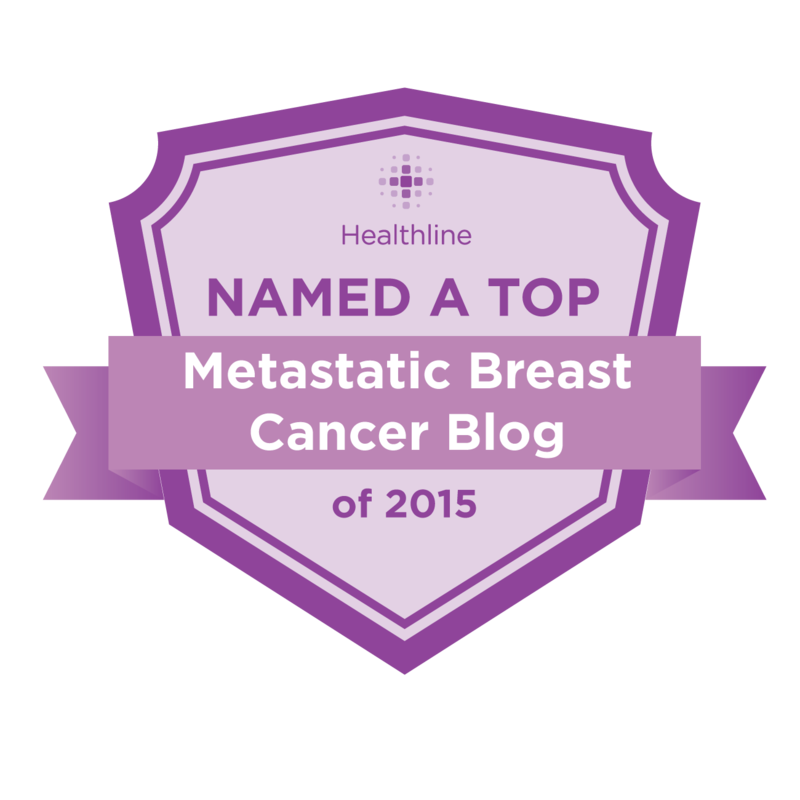 Don't forget to vote for me in the Healthline Best Blog's Contest. Here is a video of me begging asking for your vote. See, I am working for the win. :) . I so wish this cancer would leave you alone....we need you in this world! Love you Ann - so enjoy your writing! I just started reading you and had to stop in mid-read in this post. I had frozen shoulder for two years and can't believe that you have to deal with that as well. Have you tried acupuncture? I don't have the range of motion I should have but I have NO shoulder pain now. "You can do it, look at Lance."